Situated in downtown Victoria, Fort Street is known for its large collection of antique stores. Restored homes and art galleries are also among the street's attractions. Established in the 1870s, Victoria's Chinatown claims the title of the oldest Chinese district in Canada. The area is well worth visiting, with its abundance of authentic Chinese food restaurants, art and gift galleries, unique architecture and Asian import shops. At the heart of Victoria lies the district known as Old Town. Aptly named, this is one of the oldest areas in the city and still features many pieces of the past. This historic area is located immediately north of the Empress and includes Wharf Street, Government Street and Douglas Street running north-south, with Johnson Street, Yates Street and Fort Street crossing them. Many of Victoria's main attractions are located at the Inner Harbour, including many museums, the Empress Hotel and the Legislative Buildings. A walk along the boardwalk, where street performers and artists vie for visitors' attention, is a memorable experience. On the south edge of downtown, elegant Victorian homes play neighbour to the Fairmont Empress Hotel—a perennial favourite among tourists and residents alike. Most of the historic properties in this upscale neighbourhood were built by Victoria’s founding families, and feature storybook details including spires, truss work, and wrap-around porches. One such draw is Carr House, once home to beloved Canadian artist Emily Carr. Days in James Bay include stops in museums, strolls along the harbour front, and dinners at Il Covo Trattoria. At the southern tip of Victoria, James Bay spans from the serene gardens of Beacon Hill Park up to the Inner Harbour and across to Odgen Point. The district is home to many of the high-end hotels and restaurants of the Inner Harbour, a hugely popular community market and Fisherman's Wharf. Situated just minutes away from downtown Victoria on the Inner Harbour, Fisherman's Wharf is a tiny but popular area for fish and chips, whale-watching tours and more. The floating village is also home to an eclectic collection of houseboats and is most easily reached via the small Harbour Ferries which circulate regularly. While the James Bay area is a bit sparse for schools, it's full of great walking locations close to the ocean. Just a quick drive (or walk!) from downtown, it has only a fraction of the noise and bustle. From the expansive gardens and lagoons of Beacon Hill Park to the famed flight point that is Clover Point Kite Park, Dallas Road connects the dots of green spaces, oceanside walkways, and casual neighbourhood pubs and diners between the communities of Fairfield and Gonzales. East of Beacon Hill Park, the residential neighbourhood of Fairfield is home to the trendy shops and cafés of Cook Street Village, the scenic views at Clover Point and the historic Ross Bay Cemetery. Fairfield is the city's southernmost community and its largest. The top properties are near the coastline, where the Strait of Juan de Fuca waves pass and leafy trees line the streets. Historic Ross Bay Cemetery, Cook Street Village, and the Moss Street Market round out weekend wanders and Gonzales Bay Beach beckons residents to swim and enjoy the sun. Fairfield is known for its beautiful homes and friendly neighbours. Like James Bay, the area is close enough to downtown to be an easy walk, and is close to the beach. Cook Street Village in particular is famous for its walkability with locally-owned grocery stores, pubs, coffee shops, pharmacy, post office, restaurants, clinics, and even theatres all in close distance of each other. One of Victoria's most prestigious neighbourhoods, Rockland has long been established on the hill overlooking Victoria's southern coast. The district is home to the Government House, the residence of B.C.’s Lieutenant Governor, and its extensive gardens. Architect Samuel MacLure is mainly responsible for the beautiful stone walls that surround the Arts and Crafts-style mansions of the Rockland neighbourhood (some Tudor builds by other architects of the day co-mingle nearby). Situated in the northern part of Fairfield, the neighbourhood can be summed up as stately, but evolved, with expansive gardens sending a peaceful hush through the streets that lead into downtown Victoria. Nearby Christ Church Cathedral is an incredible example of Gothic architecture, perfect for a rainy-day visit. Many new additions and developments are cropping up in the area as of late, including a public water park, a new business core, and the Railyards condo developments. Situated right on bike paths that connect to downtown and the Galloping Goose, and only a roughly 20 minute walk from downtown, living without a car is more than possible. The West Bay / Saxe Point area is located in the municipality of Esquimalt in the Greater Victoria Region. It runs south of Esquimalt Road to the coastline that overlooks the Strait of Juan de Fuca. Saxe Point Park is a local gem that is littered with locals on sunny days for its sprawling green lawn and captivating vistas. It is also a popular place for wedding photos. Macaulay Point Park is also popular, with walking trails, coastline views, a small beach and boat dock. Saxe Point is often an underappreciated area. With great waterfront access and new condo complexes, the seaside community has a little bit for everyone. The closer to the ocean you get, the nicer the neighbourhood becomes, with an air similar to the Mount Doug area and a quick walk to seaside parks and the beach. Oak Bay is home to two world-class golf courses, the Uplands Golf Club and Victoria Golf Club, as well as the Oak Bay Marina and the prestigious Royal Victoria Yacht Club. There are three recreation centres in the municipality and its main shopping areas, Oak Bay Avenue and Estevan, maintain a village-like atmosphere. Oak Bay shares the University of Victoria and Camosun College with the neighbouring municipality of Saanich. Situated just east of downtown Victoria, Oak Bay feels like its own small seaside village. Old-English style streets are lined with galleries (Eclectic Gallery, The Avenue Gallery, Winchester Galleries), London-esque pubs like the Penny Farthing Public House, fine dining stops such as The Dining Room at Oak Bay Beach Hotel, and plentiful gardens, beaches, and parks. Oak Bay Marina and the Royal Victoria Yacht Club are draws for mariners of all stripes. This is a high-demand area with families, as the excellent schools are a big draw, as well as well-maintained parks. Estevan Village is little neighbourhood within Oak Bay, a short three-block stroll from Willows Beach. Here you can find restaurants, gift shops, a toy store and cafés. The Uplands is an area in the municipality of Oak Bay in the Greater Victoria Region. It was designed in 1907 by landscape architect John Olmsted and features sprawling estates, winding streets, and decorative lamp posts. 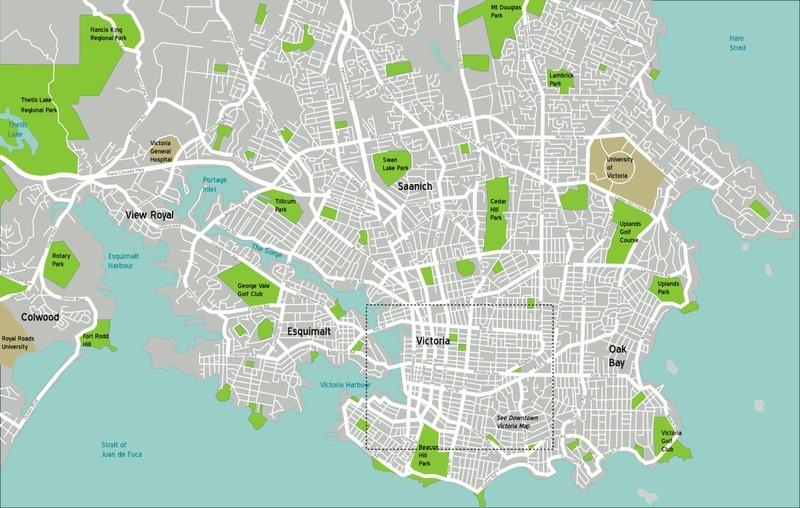 Located within this area is the wild and beautiful Uplands Park and the Royal Victoria Yacht Club. The Uplands area is Oak Bay’s prime real estate, drawing its name from the high-end homes that line the waterfront, which include some of the most sought-after luxury property in Canada. Its water access, charming neighbourhood fixtures, and recreational options are the cherry on top of the unmatched ocean vistas. Golf courses and pebble beaches make this neighbourhood feel like a vacation spot. Exploring the pathways of Elk and Beaver Lake Regional Parks and the flavours of the Beach House Restaurant are enough to keep residents satiated when they aren’t relaxing in their modern and custom-built homes. This area was made for landscape architecture, backyard grilling, and feeling at home. A stroll through the famous botanical wonder that is Butchart Gardens, sitting down for a seasonal dish at the upscale Dining Room, spending a relaxing afternoon at the Brentwood Bay Resort & Spa, visiting the otherworldly Victoria Butterfly Gardens—these are all fantastic lures to the Brentwood Bay area. Located just outside Victoria in nearby Central Saanich, the property lines are expansive and the homes vary from charming Cape Cod styles to expansive estates on Willis Point. Offering everything a little village should offer, Sidney is only a 25-minute drive to downtown Victoria while boasting good schools, walking distance to all amenities, and scenic oceanfront. Gordon Head is a solidly upper middle class family area with several shopping malls, restaurants and movie theatres within a short driving distance. Very residential with a strong supply of single detached homes, Gordon Head is known for the solid quality of its Mount Doug high school, and is close enough to the University of Victoria to see a regular stream of students looking to rent. The neighbourhoods are quiet and safe, and are centrally located enough to make it an easy trip to either Sidney or downtown Victoria, whether by car or bus. For those who like to wander, Gordon Head has acquired a positive reputation for its trails, forest area, and Cadboro Bay Beach. Home to trendy shops, cafés, and galleries, as well as Central Middle School and Victoria High School, this eclectic neighbourhood is recognized as one of Victoria's most engaging communities. Fernwood's boundaries reach from Bay St. in the north to Fort St. in the south and from Cook St. in the west to Shelbourne in the east. With an abundance of parks, pubs, coffee shops, delis, a theatre, and even a kilt store, it isn't uncommon to stroll through Fernwood in fine weather and hear the strains of someone playing an acoustic guitar. Well connected to the rest of town, you can travel from Fernwood to almost anywhere in 15 minutes by bus or car. The only downside is the lack of a central pharmacy or grocery store. The Gorge Waterway on the west side of Saanich is a beautiful setting and a popular area for young families who prefer to live close to town. The Tillicum mall, Town and Country shopping centre, and the Silver City movie theatre are all conveniently located. Roughly centered between Burnside Rd. and Gorge Rd. in Victoria's northwestern quadrant, this quiet district enjoys a scenic view of the Lower Gorge Waterway. Cordova Bay is perched along the seaside and includes a mixture of cottages, small farms, sizable family homes and new subdivisions. Located north of Victoria in Saanich on the each coast, its main highlight is an expansive pebble and sand beach that is populated by locals on hot summer days and makes for a quiet walk in the winter. Several beach access points can be found along Cordova Bay Road, such as at Agate Lane. This district is located near Elk Lake and features the Cordova Bay Golf Course. Cordova Bay Village services the area with a small shopping district mainly centred around Mattick's Farm. A relatively new area, Uptown is growing an increasing number of quality neighborhoods, all centered around the amenities of Saanich Plaza and the Uptown Shopping Centre, which boasts all manner of shopping as well as a well-connected transit hub. Cyclists will love the easy access to the Galloping Goose trail, and not having to drive to reach a bank, grocery store, pharmacy, library, daycare, or other services. The serene Swan Lake Nature Sanctuary is only a short walk away, making for a calming spot to wander in the evening.